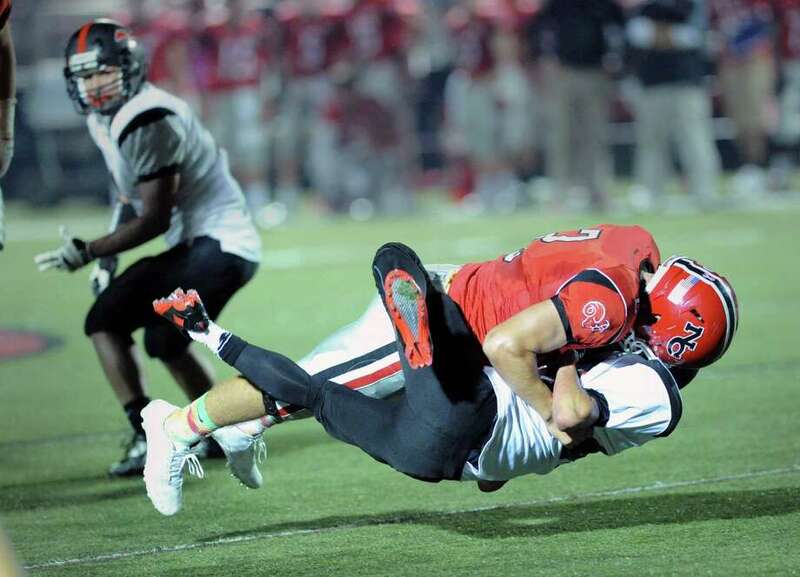 NEW CANAAN -- New Canaan quarterback Nick Cascione and the Rams' talented group of receivers and backs are the ones celebrating in the end zone and grabbing the headlines, but it is the work of the offensive line, operating in a complicated offense, that makes the Rams tick. The line work was on full display Friday as the Rams defeated Fairfield Warde 45-21. Cascione threw for three touchdowns and ran for another but was quick to credit his line for making it all possible. "Everything was working for us, we were gashing them with the run and hitting the screens and just executing well," Cascione said. "The line really does everything for us. They give us good sets with the runs, they give us good sets with the passes. I mean, if they aren't blocking we can't do anything. They are everything for us." New Canaan Coach Lou Marinelli said his offensive line often goes unheralded, but what they do is complex and the heart of the offense with guards Joao Rocha and Jim Keneally and center Ryan McKenna adjusting from snap to snap. "Not too many people notice them," Marinelli said. "It is an experienced group. It's a little complicated, you have to readjust to what you are getting, so, the center and the guard are going to have to make calls and make sure your protection is good. The good thing about them is that they make their own adjustments. It is really impressive as a coach to hear them on the field and it is really comforting as a coach to see that they get it." The Rams (4-0) used some deception to get their first score with Cascione hitting Jack Gilio in the backfield. As the defense closed on Gilio he threw 34 yards down field to Cole Turpin for the touchdown. Peter Swindell then followed with a 32 yard field goal to make it 10-0 before Cascione took over. Cascione hit Carson Armstrong for a 10-yard touchdown before running in a 6-yard score of his own. Cascione closed out the half hitting Turpin for a 25-yard strike to put the Rams up 31-0 at the break. Once again Cascione credited his line with giving him the confidence to stand in the pocket. "It helps tremendously knowing as a righty I can drop back and the whole left side of the line can protect me," Cascione said. "Having them be able to protect my back is huge." For Warde (1-3) turnovers early put them in a hole but Coach Duncan Dellavolpe was pleased with how his team battled back in the second half. "We did some good things, we had a good quarter and a half of play," Dellavolpe said. "If we didn't turn the ball over, two fumbles and a bad snap on the punt then maybe we hang in there a little bit longer but e can't let any team score real quick on us."